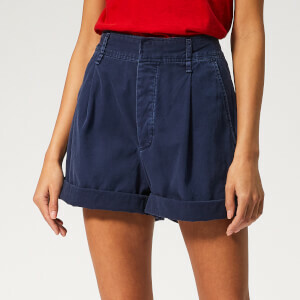 Slim fit, chocolate brown suede shorts from Philosophy di Lorenzo Serafini. Crafted from quality leather with a five pocket design and contrasting ivory-coloured stitching throughout. Detailed with a metal button closure, a zip fly and belt loops. Star-shaped studs accentuate the back pockets. Turn-up cuffs and a gold-toned foil logo badge on the rear waist complete the construction. The lined shorts arrive with a protective dust bag. Main: 100% Leather. Lining: 100% Polyester.